These photos were taken last night while we were playing a game for New Year's Eve and this showed up in only this one of the approx. 50 photos we took while playing. 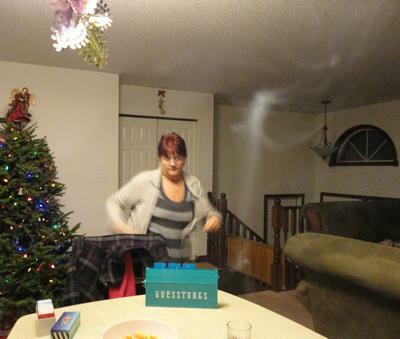 The "smoke" figure appears to be playing the Guesstures Cherades game trying to act out "Hoola Hoop" the same as she was. The four people present all believe it was a ghost and despite many more photos to try to catch it again while playing, nothing even close was caught on film again. We were smoking in the house, but has two windows wide open, one right behind the camera and the other nearby off to the left. No other photos showed any smoke taken from about the same position. I believe it was my father who was a fun loving man and would have enjoyed playing this game very much. He car was hit on the driver's side by a drunk driver who ran through a stop sign at 80 kms/hr May 28, 2011. Any insight or comments, both positive or negative, would be greatly appreciated.